I’ll start by saying this post is a long time coming. I built this rustic industrial pipe table months ago, and it’s been in our living room for quite some time now (so you may have noticed it in some of our home tour posts), but today we are finally getting around to sharing our tutorial. Our DIY Rustic Industrial Pipe Coffee Table quickly became one of our top posts and we received a lot of positive feedback from those who tried to follow our plans. Since then, Alicia has always hinted that it would be nice to have a similar side table. As a husband, you learn to read between the lines when your wife makes a not-so-subtle hint. I kept this idea in my back pocket, with plans to build it for her in the future. For our second anniversary, I was stuck for a gift idea. I wanted to do something personal and DIY (because that’s what we like to do rather than buying something), but the second anniversary gift is cotton. I have no idea how to knit or sew, nor do I plan on learning, so I thought to myself, what can I build that is similar to working with cotton? The answer is: nothing. So she was getting a gift made of galvanized pipe and wood instead. At least I knew she would like it! Just like our DIY Rustic Industrial Pipe Coffee Table, this plan is incredibly easy to assemble and inexpensive. It is such a great balance of rustic and industrial that it works in almost any decor. This smaller table can also be used as a bed-side table or adjusted in size to fit any space. Another great idea would be to add a shelf across the support bars for some additional display area or storage. And if you like this rustic industrial look, you’ll love our Rustic Industrial Shelf too. You can click on the items below to see the product from Home Depot. Using the diagram above, attach the metal parts of the end frames together. You will need to do this diagram x2 since there are two ends. Cut your wood planks into 3 x 24″ pieces. Lay the cut wood planks on a flat surface and attach together on the bottom using the 8″ steel brackets. Make sure you leave the area you plan to attach the flanges to free of brackets. Or you can use a Kreg Jig to create pocket holes and attach the boards together, eliminating the need for the brackets, and it creates a much stronger top. Place frame upside-down on wood planks and attach to the metal flanges. Once you have the frame attached to the wood top, flip the table over. The nice thing about using the threaded galvanized piping is that you can just twist various parts to adjust the level of each leg if you have uneven floors. Feel free to distress the top for a more rustic look using a hammer, crowbar, golf club…whatever you have in your garage that will make a mark! Sand top and all edges. Stain in any color you choose, and seal with polyurethane for protection from liquids. Simple as that, you have a beautiful side table in no time at all! Love the table! So cool! Great job Nick! This turned out beautifully, and I just love those pipe legs on the table! It looks so lovely in your home! About how much did they cost to build? Hi Vicki, the table cost approximately $50 not including the stain or polyurethane. Love this table and it looks beautiful in your home! How tall was the finished project? It looks like around 21″ based on my math? We just finished building the coffee table and it turned out perfect! I want to do this side table next. How would you add the shelf underneath? To add a shelf, I would cut two 6″ – 2×6″ boards a little bit longer than the span between the two legs. 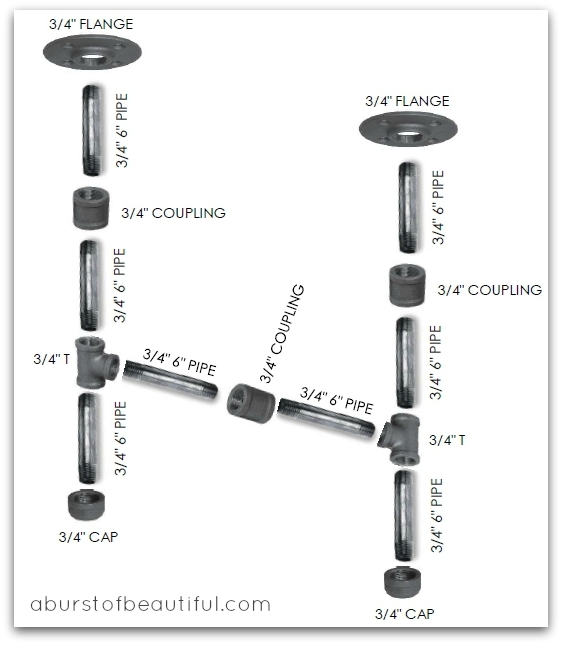 Put them on either side of the center 3/4″ coupling in the diagram and secure from underneath with clamps similar to these, but metal versions if you can find them. Or, if your boards don’t fit because they are too wide, notch or cutout space for the legs so that the boards will fit snugly. Then you won’t have to put the clamps on. Hope this helps! !